« is unsigned the same as unsigned int in c++? been working with the default color scheme that comes with emacs on archlinux. most of the times i found that after long sessions and particularly at night my eyes would hurt looking at a white background. though i have an lcd screen but the white was too much. so i started looking for a dark color theme. 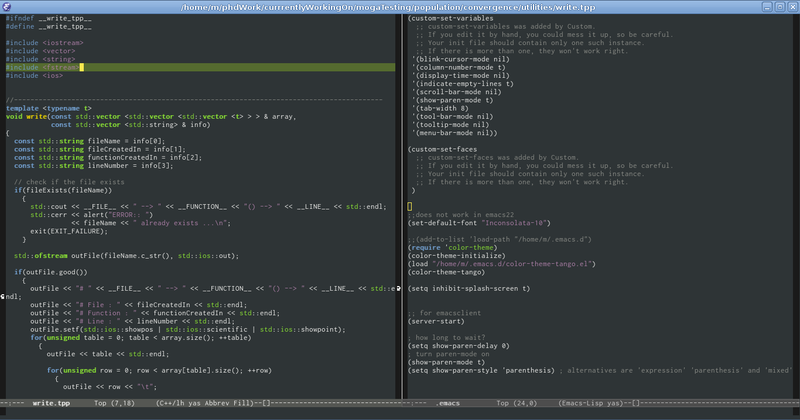 first thing i tried was to install the emacs-color-theme package on archlinux. there r about 50 color themes in there. most of them put me off so i started exploring various color themes. one of the themes that i liked is tango. i m not saying it is the best as i have not explored a whole lot of choices but suffice it to say that looking at the screen with the tango theme hurt my eyes less than the default theme. 0) put the color-theme-tango.el file some where so that emacs can find it. i simply put it in the .emacs.d directory of my $HOME. 0) the color theme page at emacswiki does not give any instruction of the sort “(load “path/to/file.el”)” so i must be missing something. 1) even when i added the file containing directories to the load-path in emacs, the files could not be found. again i must be doing something wrong. 2) what is the meaning of the error/warning message that i got? I can’t say I have a lot of experience with elisp, but the load-path, I think, is the place where emacs will look if you use require and the like, load actually loads a file. Possibly you got that error because you placed color-theme-tango.el in your load path but you didn’t specify to emacs that it should look for it, which in the 2nd attempt you did (with load). The error you got just means that the function color-theme-tango doesn’t exist, which is because it is defined in color-theme-tango.el and you didn’t load it yet. *List of directories to search for files to load. Each element is a string (directory name) or nil (try default directory). otherwise to default specified by file `epaths.h’ when Emacs was built.